Earlier this week I posted images of fiftteen burial permits from the Office of Registrar of Vital Statistics, Middletown, Conn. between 1906 and 1910. Several of these documents are for children. Each document, which is a small piece of paper (approximately 3 byt 5 inches), offers the cemetery name, age, place of birth, place of death, date and cause of death and the attending physician. These are handwritten documents, thus are subject to interpretation. Surnames included FALL, KINSEL, FOSTER, BROWNLOW, CENS, BALL, RACH, BARNES, DANIELS, LIVINGSTONE, DERTRECK, HALFMANN, BROCK and FLICKINGER. 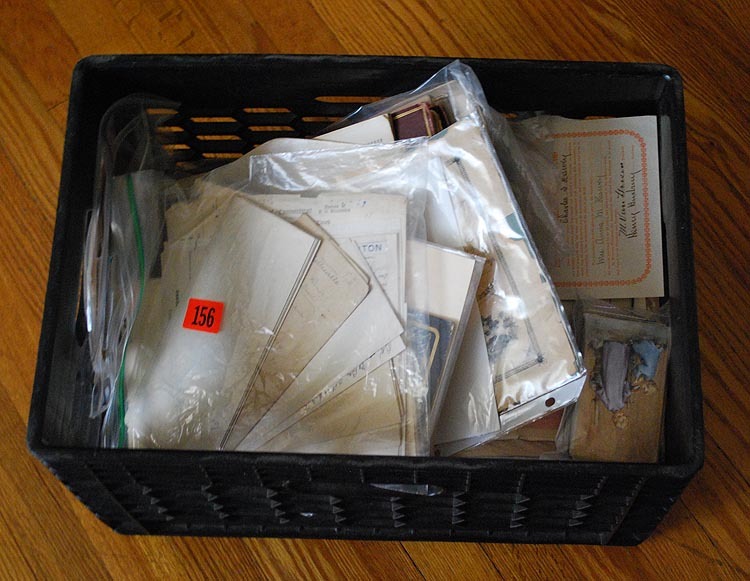 These items were posted into the Death Notices, Obituaries and Wills collection, which is part of the Genealogy Today Subscription Data service. My search for additional Panama/Pacific Mail lists will continue! ALSO sneaking into this batch of records uploaded: images for 66 In Remembrance Cards (1880-1933), 3 U.S. passports (von Lowensprung 1964, Fleischman's 1949) and 1 marriage announcement (Lindman/Anderson 1886). Hey Genealogists, don't you just LOVE those Composite Photos with Names? One of the best discoveries a genealogist can make is finding a clearly identified photograph of an ancestor, and composite photos are a great resource. Schools, fraternal groups and even clubs had them taken for their organizations, and whenever I see one for sale, I just cannot resist buying it. 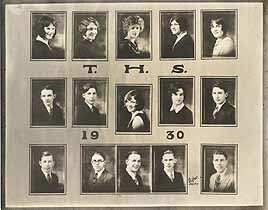 The one shown along side this blog post was from Titonka High School in Titonka, Iowa. I googled the town and apparently the population was 584 at the 2000 census. Two others are from Plevna, Kansas, which according to the the 2010 census, has a population of 98. Additional photos are in the pipeline, and should be online in a few weeks. Severe power outage here in New Jersey. Expect delays in the delivery of The Genealogy News and our regular database updates. I love discovering names in unique documents, and I've seen plenty of souvenir passenger lists, but none like these from the Panama Mail Steamship Company. They're tri-fold postcards that I suppose a passenger would mail to family or friends (?). Souvenir passenger lists are not a substitute for the actual ship manifest, but they are a pretty good indicator that the ancestor did travel on the ship; or at least they purchased a ticket. 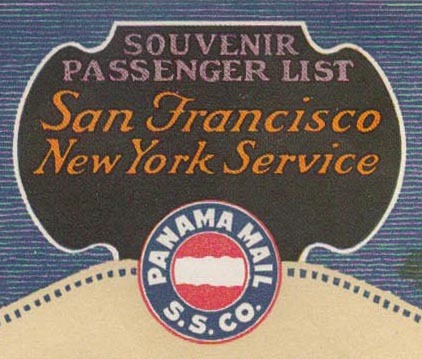 These postcards list the passenger names along with their destination, some of which include Mazatlan, San Jose de Guatemala, Acajutla, Havana and New York. On the cards I've seen less than half of the passengers make the full cross-coastal trip. The names/titles of the officers are also listed. This shipping company was formerly called the Pacific Mail Steamship Company, established 1848. The 1922 postcard listed below uses this name, the others have the Panama name, but formatting and marketing text on backside is exactly the same. "Operating the steamers Columbia, Ecuador, Venezuela and Santa Ana, between San Francisco, Los Angeles Harbor, New York through the Panama Canal." 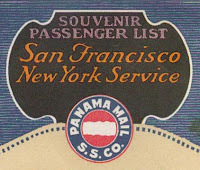 Additional Panama Mail S. S. Co. cards in the pipeline and will be posted online shortly! Catch up on the top stories mentioned in The Genealogy News service throughout the month by reading the Monthly Edition! Visit our News Center at http://news.genealogytoday.com/ to download the PDF for July 2011. Most days of my week are spent digitizing original documents as part of the Subscription Data service at Genealogy Today. Every once in a while, I take a break from the normal routine and got digging through the boxes of unsorted materials that occupy one corner of the offsite storage facility that I lease. And today was one of those days. These boxes are from estate sales and/or auctions, and are filled with all sorts of stuff. Most of it ends up being recyled, but there are quite a few genealogical gems (why else would I buy them right?). Today's mining expedition yielded 21 marriage certificates/announcements, a dozen or so passports, numerous death certificates, some coroner's inquests, burial permits and a variety of other nifty documents. As I'm writing this post, my scanner is hard at work, processing the marriage documents. Earlier this week I prepped a stack of sixteen other marriage items; the combined set should go online this Sunday, and you'll be able to search through them here. Many of the miscellaneous items will trickle out to the free Family History Wiki later this week. The death items should go online the following week, and will be searchable here. 1855/Hewson, 1867/Hughes, 1877/Maris, 1881/Blum, 1883/George, 1886/Moutzer, 1887/Jackson, 1887/Rogers, 1887/West, 1888/Atwood, 1888/Schaefer, 1891/Clopper, 1891/White, 1892/Robinson, 1892/Webster, 1894/Reese, 1895/Scotchmer, 1899/Berger, 1902/Ward, 1903/Prutton, 1905/Mackley, 1906/Hulseberg, 1909/Leppley, 1912/Moulton, 1916/Fredrickson, 1922/Borgstrom, 1922/Merritt, 1930/Runne, 1934/Hull, 1935/Stedman, 1940/Lowry, 1943/Bowers, 1946/Vetashiek, 1948/Horan, 1950/Fleury, 1954/Kuhl, 1964/Keller. As many of these are handwritten, the names posted are subject to change when the documents go through the transcription process and review.